As part of its ongoing attempt to invent a Palestinian history, the Palestinian Authority tries to hitch a ride into the past with Jesus. Whereas the historical Jesus was a Jew living in Judea/Israel, the PA turns him into a “Palestinian”: “We must not forget that Messiah [Jesus] is a Palestinian, the son of Mary the Palestinian.” [Al-Hayat Al-Jadida, Nov. 18, 2005] This is not only a distortion of Jesus’ personal history, but also an anachronism. The Romans changed the name of Judea/Israel to “Palestine” 136 years after the birth of Jesus, to punish the Jewish nation after their unsuccessful rebellion. In another anomaly, Jesus is turned into a Shahid – a holy Martyr of Islam. Whereas Islamic teachings do view Jesus' gospel as part of the Islamic prophetic tradition, nowhere does Islam refer to him as a Shahid. "Director of [PLO] Commission of Prisoners' Affairs Qadri Abu Bakr, Ramallah and El-Bireh District Governor Laila Ghannam, Ramallah Mayor Musa Hadid, and a delegation of Christian clergy… visited families of prisoners from the Christian communities yesterday [Jan. 2, 2019]… for Christmas. The delegation blessed the prisoners' families and their children. The delegation visited the family of prisoner Ibrahim Mas'ad Hani (i.e., terrorist, murdered 2), sentenced to life… Abu Bakr said that the visit to the families from the Christian communities is a message for Christmas and of freedom, which the Palestinian people is conveying to the world so that justice, peace, love, and unity will prevail in the land of Palestine – which will be achieved when the occupation leaves and when our people is able to live in dignity, independence, and freedom. Abu Bakr conveyed the blessings of [PA] President [Mahmoud Abbas] to the Christian families and to all of the male and female prisoners in the occupation's prison. District Governor Ghannam said: 'At this opportunity, we bless all of the members of the Palestinian people for the national holidays, which are not just Christian. We are proud of Jesus being Palestinian.'" Fatah officials: "Jesus was the first Palestinian"
"Dozens of members of our people lit the Christmas tree last night [Dec. 19, 2018] in the village of Khan Al-Ahmar (a site where Palestinian Bedouins illegally erected dwellings; see note below –Ed. ), east of occupied Jerusalem. PLO Executive Committee member and Fatah Central Committee member Azzam Al-Ahmad said: 'The lighting of the Christmas tree each year has many meanings in Palestine.' … He added: 'Christmas is one of the permanent Palestinian symbols, and the whole world follows Mass in Bethlehem… The children of Khan Al-Ahmar are happy about the lighting of this tree, as it is the symbol of the first Palestinian, Jesus, peace be upon him. We, the members of the Palestinian people, are celebrating Christmas together with everyone in the land of Palestine.' … Secretary-General of the National Initiative [and PA Parliament member] Mustafa Barghouti… said: 'Jesus, who was born on this land, was a Palestinian and defeated his suffering. This tree hints at an additional victory that the members of our people will achieve at Khan Al-Ahmar.'" The image shows a drawing of Jesus wearing a crown of thorns and a keffiyeh (Arab headdress) around his neck. 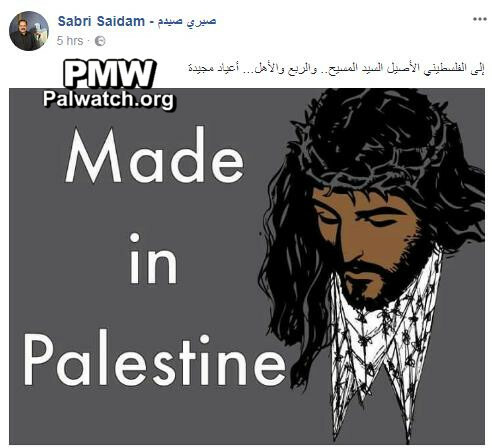 Text on image in English: “Made in Palestine"
Sabri Saidam also holds the following positions: Fatah Central Committee Deputy Secretary, Fatah Revolutionary Council Deputy Secretary, and President Mahmoud Abbas’ advisor for communications and information technology. 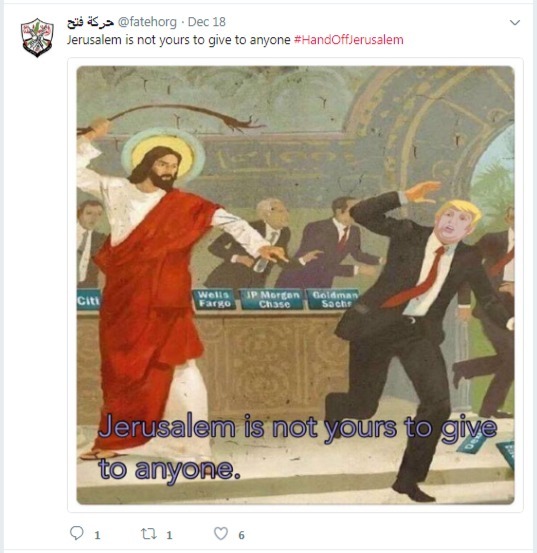 Fatah’s cartoon shows Jesus chasing Trump out of Jerusalem with a whip in a scene reminiscent of the Christian Biblical narrative when Jesus cleanses the Temple, driving out the merchants and the money changers. In the background are three men wearing suits behind a desk with four name tags bearing the names of American banking companies: “Citi[bank],” “Wells Fargo,” “JP Morgan Chase,” and “Goldman Sachs.” The text on the cartoon says “Jerusalem is not yours to give to anyone.” Fatah repeated this in its tweet, adding the hashtag "#HandOffJerusalem." "Palestine has never brought anything to the entire world but this message, the message of love, tolerance, and peace. There is no better and clearer proof of this than the message of the righteous Palestinian Jesus Christ, peace be upon him, who bore his cross while the crown of thorns wounded his forehead. He walked through the Via Dolorosa, bore the suffering of this path, and became the savior of all mankind and its redeemer from the injustices of hate and its destructive ailments." 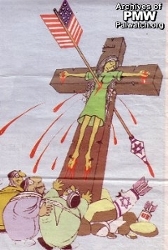 Posted text: "For Christmas, the birthday of Jesus the first Palestinian and the first Martyr (Shahid), peace be upon him, we will surely stop the path of suffering (i.e., referring to the Via Dolorosa, which Christians believe to be the path Jesus walked on his way to crucifixion) and go up to the free Palestine, happy New Year." Senior Fatah official: "The whole world knows that Jesus was Palestinian"
Official PA TV host: "We need to begin to realize the dream of independence from here, and the whole people, led by [PA] President Mahmoud Abbas [will do this]. 2017 needs to be a year of realizing our independence, and establishing a sovereign state and self-determination. People are asking: ‘When we talk about this important and wondrous matter, which every Palestinian hopes will be realized, on what facts are we depending?’"
Fatah Central Committee member Abbas Zaki: "There are two facts. 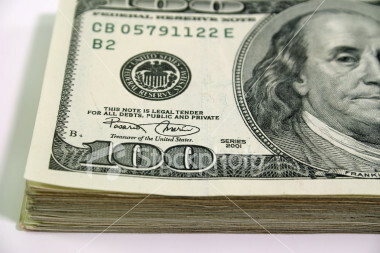 The first fact is that we are depending on the justice of our cause, and its spiritual status. After all, the whole world knows that Jesus was Palestinian, and also, the Muslims know that Prophet Muhammad was led on the Night Journey from the Sacred Mosque [in Mecca] to the Al-Aqsa Mosque." The delegation included [PA] Minister for Jerusalem Affairs and Jerusalem District Governor Adnan Al-Husseini, PLO Executive Committee member Hanna Amira, Palestinian Ambassador to Germany Khouloud Daibes, and Palestinian Ambassador to the Vatican Issa Kassissieh. PLO Director of Prisoner’s Affairs and Ramallah District Governor visit families of imprisoned terrorists, governor claims Jesus was "a Palestinian"
"District Governor of Ramallah and El-Bireh Laila Ghannam... receiv[ed] the Liberty Bell from [Philadelphia] City Council member Maria Sanchez in Philadelphia, Pennsylvania, [USA] yesterday [Jan. 30, 2015]... In addition, Ghannam received a Citation of Honor, which has never been awarded to any Arab leader or citizen before, in recognition of her impact and her extraordinary actions for her nation and her cause, and her influence within her society and in the world... [Ghannam] made it clear that the land of Palestine was the cradle of love and peace, noting that Jesus was Palestinian, and that tolerance is one of the Palestinians' most prominent principles." 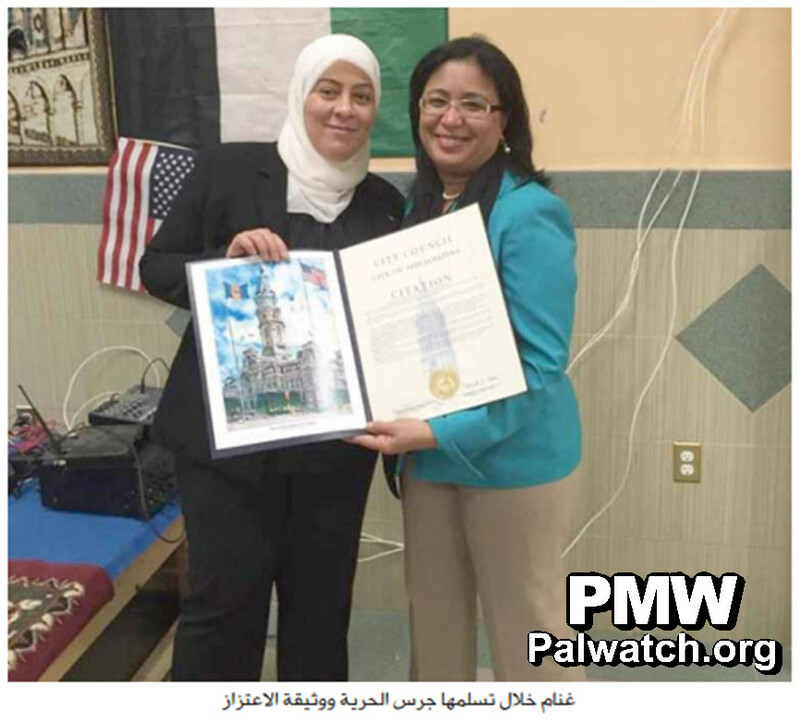 Ghannam gave the parliamentary representative [City Councilwoman Maria Sanchez] a memento from the Palestinian heritage, and noted that this is our heritage, identity and the legacy of our ancestors. She also noted that the occupation (i.e., PA euphemism for Israel) was trying to steal it by using it in Israeli fashion shows and for the uniforms of the Israeli airline attendants. Ghannam clarified that stealing is their [the Israelis'] conduct, as they have stolen the land, and are now trying to rob all that is Palestinian, without anything to stop their savagery, criminality and unrestrained terrorism." Note: To view descriptions of the terrorists that Ghannam has honored, click the link the the bulletin (above). Click "full article" to view more photos of the event. Official PA TV program Picture Story on Hilarion Capucci, the Melkite Greek Catholic archbishop, presented by Muwaffaq Matar, columnist for the official PA daily.